IAG Cargo has launched a new pet transportation service on flights from the UK through its partnership with PetAir UK and British Aiways. 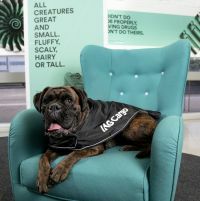 It offers an improved online booking experience and custom crates to suit each pet and coincides with the unveiling of IAG Cargo’s new meet-and-greet pet area at London Heathrow. PetAir UK offers a UK-wide home pet collection service and can also manage all import permits, export documents and fulfil veterinary requirements in house. All pets are flown in a temperature-controlled environment in customised crates that are lined with layers of absorbable vet bedding that wicks away moisture.